We are a team of data-driven digital experts set on delivering cutting-edge, custom solutions to our clients. We exist to provide businesses with a clear digital direction by serving as an extension of their team. Ranging from Fortune 500 companies to small family businesses, our clients are in nearly every industry, and we wouldn't have it any other way. Every client is unique, and we love finding the right approach for each. What started as a two-man web design and development partnership in 2007 has grown into an award-winning digital agency. The success of Blue Compass is driven by our team of digital experts who believe in our mission and will to do whatever it takes to help our clients succeed. Whether you're an intern or part of the leadership team, we are all here to support one another. Simply put, Blue Compass is a partnership, not a platform. Digital innovation isn't one-size-fits-all, what works for one client may not work for another. When you start your relationship with Blue Compass, you are signing up for more much more than a platform solution. Instead, you'll begin a long-lasting, positive partnership backed by an entire team of the best people in digital, design and development. We thrive on helping you succeed and serving as an extension of your team. We intentionally foster a positive and collaborative environment, continually encouraging one another to learn new skills that grow our expertise. Everyone at Blue Compass brings different knowledge to the table so that our design, development and marketing ideas are always moving clients in the right direction, towards their goals. Digital is continuously evolving and our team is changing and growing right along with it! 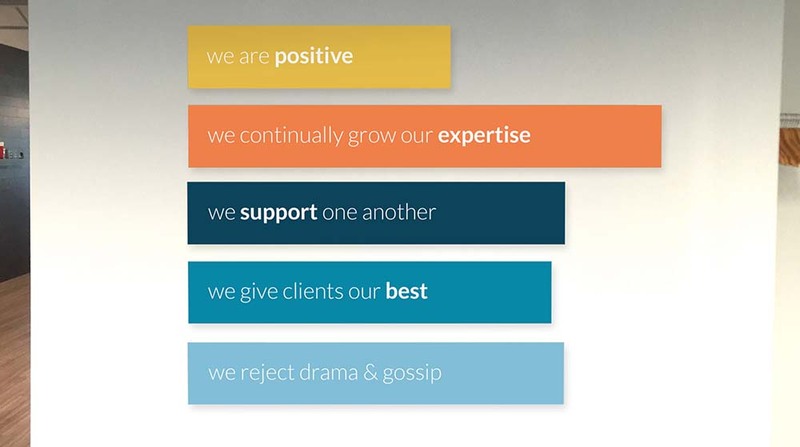 This is fundamental to us at Blue Compass; it's even one of our values: We continually grow our expertise. We think that work should be fun, and we sure know how to make that happen. From themed Fun Fridays to holiday parties and the spontaneous office gatherings, our team loves spending time together. We believe that laughter is the best gauge of a healthy work culture and that the occasional distraction is essential to a productive workday. We encourage everyone to be honest and open with each other. Our office layout is entirely open - whether you're on the opposite end of the office, in the cafe or sitting in our lounge, you won't miss a thing. This allows our team to communicate efficiently, witness the latest office prank and gives us space for our nerf gun fights. The truth is, supporting one another is easy since we care about each other. You'll never find us competing to be the best (unless it's our office March Madness tournament or Fantasy Football) because collaboration and teamwork are what we're all about. At the end of the day, the team always comes together to exceed our clients' expectations, and for a celebratory happy hour afterward, of course. At Blue Compass we really are a team. We celebrate successes and face challenges together. No matter who you ask in the office, you will hear again and again that the people and support make Blue Compass the incredible place it is to work. What Keeps Us Moving Forward? To provide a clear digital direction by serving as an extension of each client’s team. We strive to be the most knowledgeable experts in the web industry. Our passion for digital drives us to constantly learn and educate one another. We strive to produce the absolute highest quality design, development, marketing and customer service for our clients. We seek to be positive in everything we say and do. We commit to have an enjoyable, drama-free work environment. We commit to assist each other and work successfully as a team. We respect, encourage and help develop one another. Whether you're looking for a business partnership or an advanced team that will help you grow in your career, Blue Compass is what you're looking for. If you're looking for a company which values collaboration, innovation and a good office prank, apply for one of our open positions below. We are seeking a .NET Web Developer experienced in building websites, web applications and mobile applications.